What is considered "rugged" varies by application, and finding the right rugged solutions for a particular application can be a daunting task. As unmanned vehicle requirements are refined and technology updated, PC/104 will be there to meet the challenge. 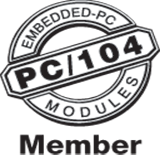 Though each approach to embedded design has its particular virtue, only one incorporates stackable, mezzanine, and card cage attributes: PC/104. In the early days of modern electronics, the U.S. military was a major driving force of advanced electronic research and development. With the nuclear arms race, space exploration and exploitation, global awareness, and advanced armament development happening throughout the world, the need to push the frontiers of science and technology was a major requirement. Rugged, modular, and off-the shelf. PC/104 fits the bill for militaries everywhere.